Earn a fortune with the Fishy Fortune video slot!! This 10 payline Video Slot is full of scatters, wild symbols and the probability of 30 free spins. The theme of this video slot is based on an underwater world of fish and fortune. In this online casino game you can also find a progressive jackpot prize just waiting to be won. Everyone knows and loves that lovable fish Nemo, and this video slot is based on the colourful happy go lucky fish. The fishy symbols even give a slight resembalance to the Disney movie The Little Mermaid, let’s hope you win more under the sea! Update: unfortunately Fishy Fortune is no longer available. The jackpot in Fishy Fortune is a progressive jackpot, which means that the more it is played the higher the pot becomes. 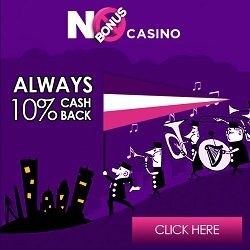 Everytime a player plays this video slot with the maximum bet then a portion of the bet is added to the jackpot. Winning the prize is also only possible when you are playing at maximum bet. This online casino game has 10 bet lines to bet on, but only 1 coin and bet level choice. The maximum bet per spin is 1 euro, so you can play this game for hours of fishy fun. Fishy Fortune free spins are won when the scatter symbols, oyster symbols, stop on the reels in any postion but you must have three or more to win. For 10 free spins you must have 3 scatter symbols on the reels, for 20 free spins you will need 4 scatter symbols and for 30 free spins 5 is the number of scatter symbols needed on the reels of Fishy Fortune. Free Spin wins pay out three times the line value of any winning combination made during that time. The only exception from this rule is the jackpot prize, unfortunately this will nto be tripled if you happen to win it during your free spin round.